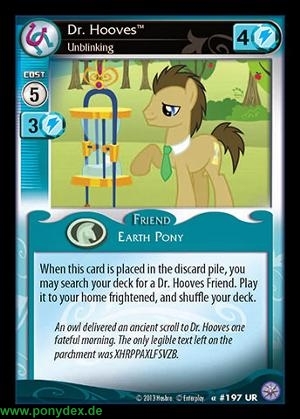 When this card is placed in the discard pile, you may search your deck for a Dr. Hooves Friend. Play it at your home frightened, and shuffle your deck. "An owl delivered an ancient scroll to Dr. Hooves one fateful morning. The only legible text on the parchment was XHRPPAXLFSVZB."